In life and daily business tasks, technology has the potential to make everything easier, more efficient, and give you the freedom of mobility. Combinations of hardware and software will allow greater flexibility and even help a busy individual like you to find a better work life balance. 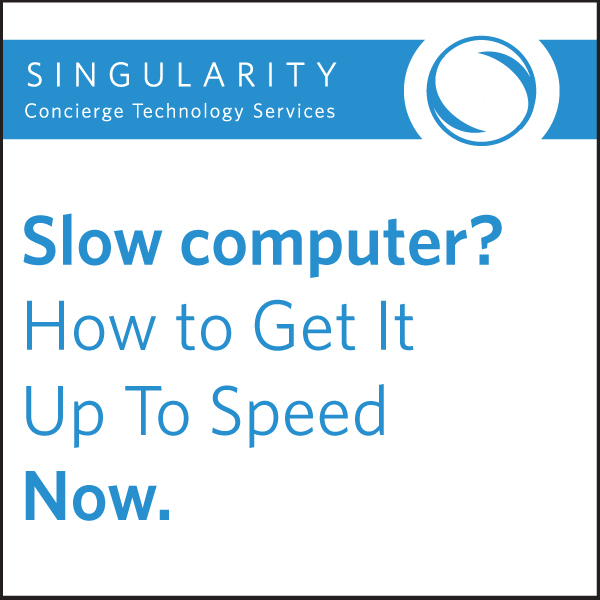 But how can this technological utopia be realized when you are frustrated that your computer is so slow? Malicious files include viruses, malware, and spyware. While there are differences as to the purpose of each type of file, the most important thing the remember is that they harm your system, slow them down, and can lead to device failure. The best way to ensure this is not the cause of the poor performance is to have a current copy of an antivirus program and update it regularly. Another way to increase the speed of your computer is to remove unnecessary apps that are taking space on your system. This includes applications that were included with your computer and ones that may have been auto selected to be installed during a software installation. Unfortunately, many computer speed issues find their root in hardware. If you are using more than 80% of your total hard drive space, your PC will run more slowly. An easy remedy is to purchase more space. The storage can be internal if it is not already at a maximum, or it can be external. At some point (usually 3 – 5 years after date of manufacture), the slower response of your computer is due to the age of the hardware and the demands of newer technology. If you discover your PC is running too slow, first run an antivirus scan, then be sure to remove unwanted applications, check the amount of hard drive space available, and if your PC is more than 5 years old plan a purchase.